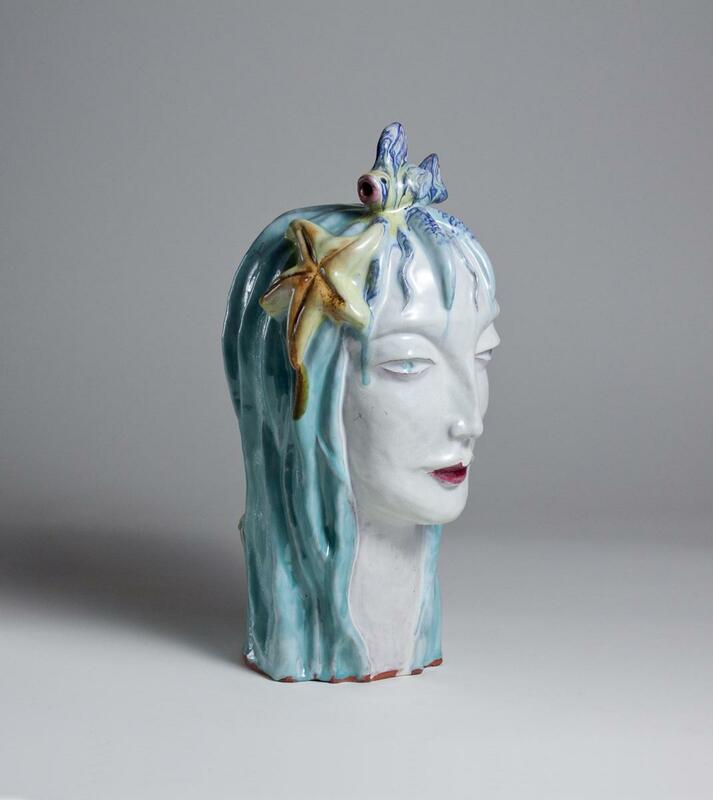 Dina Kuhn is known as one of the leading female ceramicists of early 20th century Vienna along with Vally Wieselthier, Hilde Jesser, Susi Singer, and Erna Kopriva. 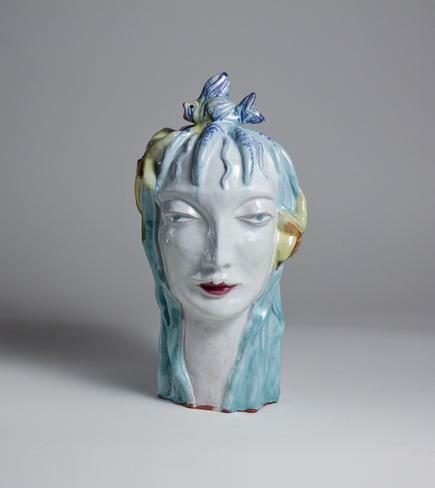 Trained by Josef Hoffmann and Michael Powolny at the Kunstgewerbeschule in Vienna, she designed ceramics for the Wiener Werkstätte until the mid-1920s, when the Bimini Workshops opened a ceramic studio and installed Kuhn as its head. Kuhn is known for a series of large-scale ceramic female heads known as "Frauenkopf." An elemental take on the series, Das Wasser was first exhibited in the 1925 Exposition Internationale des Arts Decoratifs Modernes et Industriels. From 1928-29 the piece traveled across the United States with other selections from the Exposition, beginning with a stop at the Metropolitan Museum of Art and followed by Philadelphia, Minneapolis, Cleveland, Detroit, Newark. 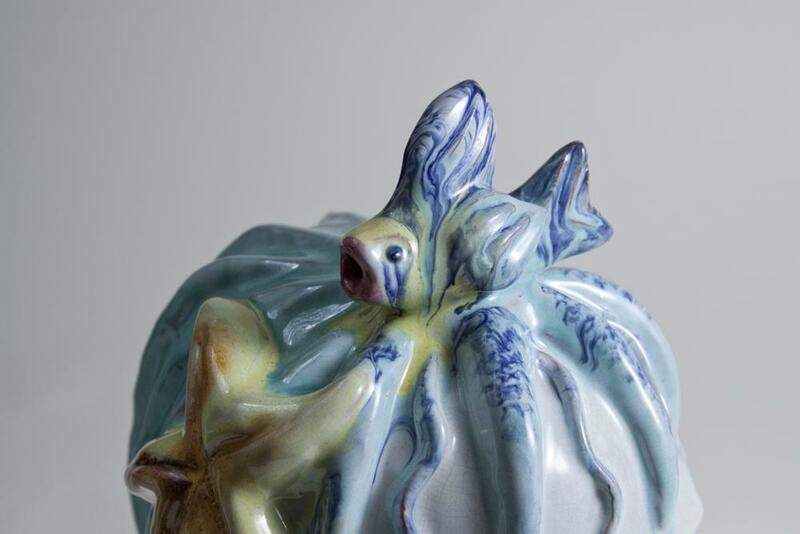 There are at least three other known examples of "Das Wasser;" The first can be seen in the 1925-6 edition of the periodical Deutsche Kunst und Decoration in an article about Kuhn's contributions to the Bimini ceramic workshop. A second version of the sculpture, possibly the example exhibited in the 1925 Exposition, was acquired by the Cleveland Museum of Art in 1929 under the direction of noted ceramicist Viktor Schreckengost, which is currently on view in the exhibition The Jazz Age: American Style in the 1920s , on view at the Cleveland Museum of Art from September 30, 2017 through January 14, 2018. A third example was acquired by the Everson Museum of Art in the 1980s. Each of the four "Das Wasser" heads feature unique choices in modeling and glazing, distinguishing one example from the other. This particular example features a noticeably more saturated color palette (especially notable in the deep red lips and teal hair), with a particularly fine application of drippy glaze on the fish nestled atop the figure's head.